We have three stages of fish in the Salmon River right now. 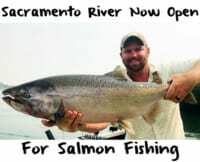 We have fresh fish, fish that are staging to spawn and some steelhead that are post spawn fish. There’s a lot of fish in the system right now. It seems like the Salmon River is loaded. I think that the water is so cold that most of the steelhead haven’t spawned yet. It’s not acting like a March fishery yet. It’s acting like we are in late February. The good news is it’s fishing better than it normally does this time of year. There’s more than the normal amount of fish in the system. On a normal year there would be a lot more spawned out fish in the system, but we haven’t seen as many as we are used to this time of year and there’s no telling exactly when we will. These fish are going to start spawning when Mother Nature tells them to. When they do spawn, however, there’s going to be a lot of drop backs in the system. 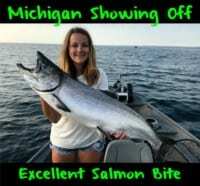 On Lake Ontario, the Salmon River is probably our longest system that the steelhead migrate into and because of it’s length, the number of tributaries and the deep, cold water, the steelhead don’t seem to be in a huge hurry to swim back to Lake Ontario. They’ll stay in this system longer than others nearby, which means there’s going to be a lot of fish in here for a while. Drop backs aren’t the prettiest fish. However, they are like Pac-Man going back down the river. They eat everything they can find, which makes March and April a fun time to fish. There’s a lot of action. We have 20-30 fish days in April. If we don’t catch that many people don’t get excited. Another great attribute to post spawn fish is they tend to school up. So when you find one there’s a good chance you found a bunch. Now even though they will often eat anything in sight, I find that smaller is better. We don’t need to run big bags this time of year. When the water is high I’ll use dime to nickel sized bags. On the other hand, if it’s low and clear I’ll drop down to pea size. I run brown trout eggs and cure them in Natural BorX O Fire and only need to put seven eggs in a bag. Another great bait is a Great Lake Steelhead Company bead. These match the hatch when it comes to the large volume of single eggs in the system. What I found to be most effective is to coat the beads in Pautzke Liquid Krill. We also pull plugs in the spring. Normally, I run size 30 and 35 Hot Shots and K-9 and K-11 Kwikfish. I also apply a healthy coat of Liquid Krill to my plugs before putting them in the water. While it might read late March on your calendar don’t hang up your steelhead gear just yet. There’s still a lot of great fishing to be had on the Salmon River this year. Editor’s Note: Andy Bliss operates Chasin Tail Adventures. 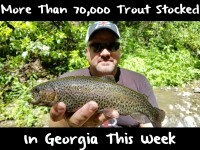 For more info on his Salmon River steelhead trips please visit http://chasintailadventures.com/.